Do you know if it’s possible to set up a simple (preferably also stable/reliable) collaborative system using TaskPaper with Dropbox? Henrik – can you give me an example of what you’re looking for? jquig99 – I’m looking for the simplest kind of solution for managing and syncing tasks with my teamworker (wife). Searching for a quick and easy solution, TaskPaper looks promising. She’s got one stationary Mac and I’m using a MacBook Pro and an iPhone. I wish for us both of us to be able to maintain and sync a mutual .taskpaper file via DropBox. A great advantage would be if there’s a way I can edit the same .taskpaper file on my iPhone as well; keeping all 3 instances in sync. If this is possible, I think TaskPaper *might* just provide a working system for us to somehow delegate tasks to each other (perhaps by means of tagging or some other mechanism within its feature set). 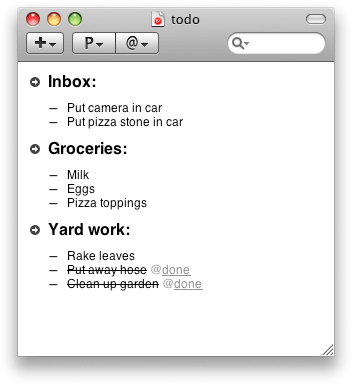 So I’m wondering if someone else has used TaskPaper in a collaborative way such as this, or similar.